A tearful Ann Marie Haggerty watched her son Aidan ride a “two-wheeler” bike for the first time Wednesday morning. Aidan, a 15-year-old with a form of autism known as pervasive developmental disorder, honed his skills in the Aberdeen Tab Ramos Sports Center roller rink with the help of his friends — volunteers at the iCan Bike Camp sponsored by the Friendship Circle, a Monmouth County based non-profit organization that helps special-needs children and teens learn social and recreation skills. 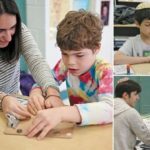 The camp is designed to help special needs children and teens learn how to ride a bike in five days, Friendship Circle Director Chanale Wolosow said. This week a team from the iCan Shine organization, a Paoli, Pa.-based non-profit that specializes in training special needs children in sports, will come in with roller bikes, retrofitted bicycles with handles attached to the rear to aid volunteers in guiding the youths and adjustable rollers beneath the back wheel to aid with balance. Leaders Kevin Crenshaw and Lily Gross trained local volunteers and will work with the 35 children registered for this camp. The camp operates in five different 75-minute sessions, with seven kids in each session. 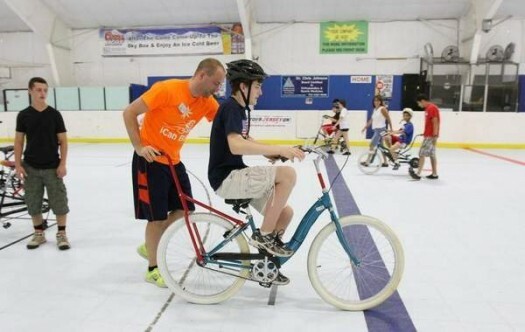 The kids bike around the rink and with each successful succession of laps move to a bike with a more angular roller. The more angled the roller, the more the biker must do to maintain balance. By Friday, each camper should be able to ride a normal bike outdoors alone, says Wolosow, who adds that the camp operates with a 80 percent success rate.